The Road to Rome quilt block is a perfect choice for a beginner quilter as it is a simple nine patch featuring the first types of patches that you would learn as a new quilter. Those patches are known as half square triangles and flying geese. 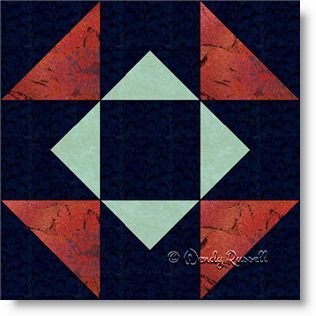 You might choose this block to add to your growing collection of "road" quilt blocks. I have linked to some of those below. The two sample quilts illustrated use standard quilt block settings -- one is a side by side layout with sashing strips to separate the blocks, while the second quilt features the blocks set on point with additional blank blocks.